Note: For instructions on using the shopping cart, click here. Green - means that particular item is not hazardous whatsoever. Red - means that the item must be shipped hazardously, regardless of qty ordered. If you are placing an order with us online, you must be on file with us, regardless of what your first order is. This means that we have to have a signed in ink order form and a copy of your driver's license on file. If you do not have these things on file with us, it will just delay your order. You only have to do it once and then you can order whenever you would like. Go to our order form page to print out the order form there. Then you can use that to fill out and send in. If at any time you want to review your order so far, please click below. Make foolproof sure fire pull cord igniters for less than 32¢ each! Each kit contains enough materials to make 100 pull cord igniters with fuse barrel! Easily the best value anywhere! Comes with friction mix and ignition cup pyrogen (less oxidizer). Simply mix a very small amount of potassium chlorate into the ignition cup pyrogen and coat cup. Then coat end of cord with friction mix, allow to dry and staple into paper fuse barrel - simple! Only takes a few minutes per dozen. Also required that are not included in kit is a 1/4" Bostitch plier type stapler (Google it). We use a bostich model P3 staple pliers and SP-19 1/4" staples. Stapler and staples available from office supply stores everywhere. Comes with complete instructions and diagrams. Note; the kit no longer comes with pre-cut tubes, instead, they are black and yellow and you cut them to length yourself. 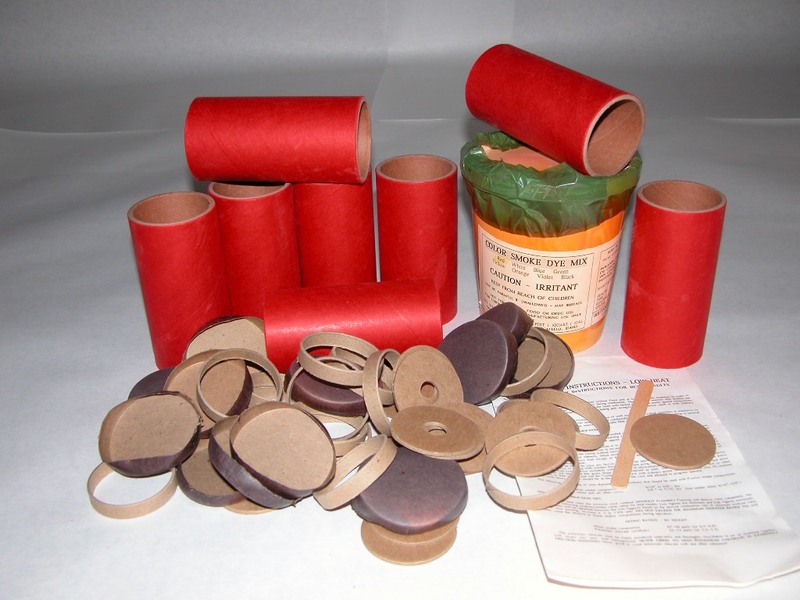 Make enough friction striker igniters to ignite 50 devices for less than 50¢ each! Excellent for emergency survival firestarters! Use to ignite smoke devices, signal hand flares, thermite pellets, delay devices of all kinds, etc. Comes with friction striker mix and ignition cup pyrogen. 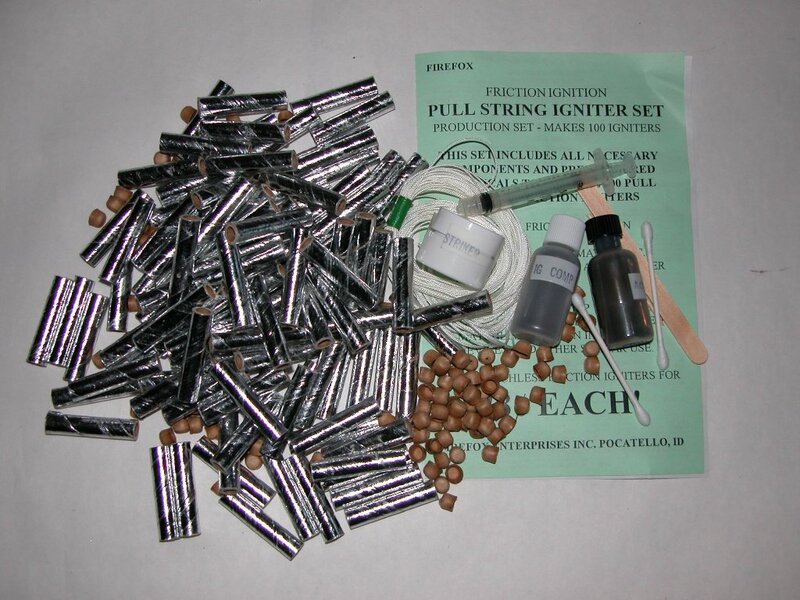 Add a small quantity of potassium chlorate to the ignition pyrogen, mix and coat directly onto fuse, flare comp, etc. One strike from the striker on a book of matches ignites the device - simple! Comes with complete instructions with diagrams of various ignition system and miscellaneous materials to complete 50 or more igniters with strikers. 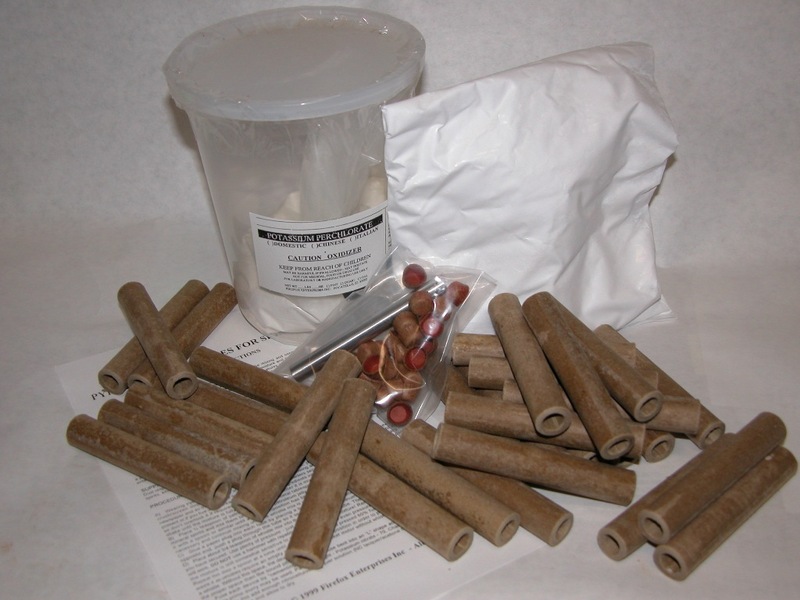 KT150 - $24.50/KIT - 1LB/KIT - FS Non hazmat shipping by UPS or USPS NOW BACK IN STOCK! Make 9 large tactical smoke canisters for less than $4.80 (white) or $6.45 (color) each!! For those of you who need volumes of richly colored or cloud white smoke, here is the kit you need. Great for paramilitary/paintball games, police and firemen training, checking wind drift, special effect stage effects or signaling. Easy step by step instructions to follow. All you do is add potassium chlorate (now supplied in kits making 9 devices), mix and assemble the devices. Comes with long cut-to-length casings, solid discs, seating rings, punched vent discs, outer finish caps and smoke mixture. Also required (not supplied) is adhesive, safety fuse and/or pull wire or friction striker igniters (order the kits and save). Kit no longer comes with color pre-cut tubes. They are now longer, natural kraft that you cut to spefications. Note; Our smoke colors are by far the best rich, vibrant colors available! The tube colors depicted here are accurate colors! 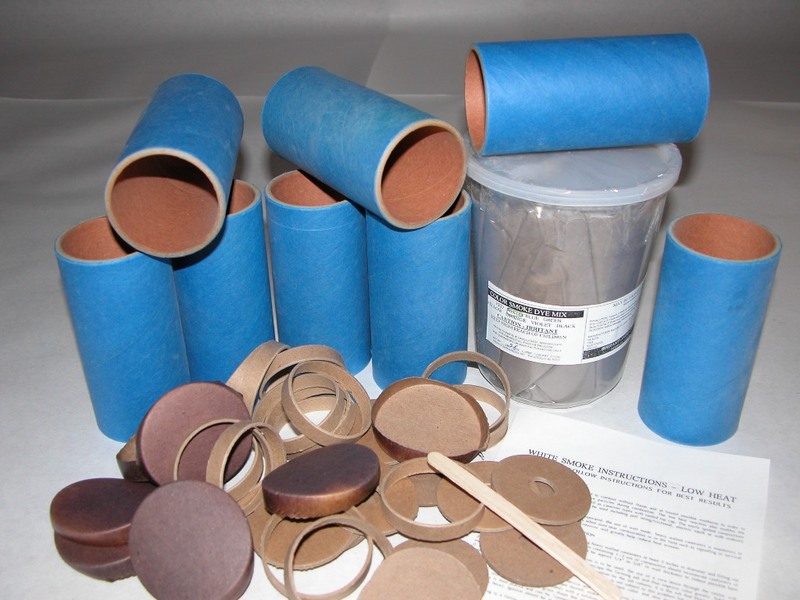 The casings are 2" inside diameter and produce enough smoke to simulate tactical military devices! No ATFE required to order these kits with tubes. KT200/R - RED 2 ID X 4 1/2 L W/HARDWARE - $58.00/KIT - 4 LB/KIT Makes 9 large tactical devices. KT200/W - WHITE 2 ID X 4 1/2 L W/HARDWARE - $47.00/KIT - 4 LB/KIT Makes 9 large tactical devices. KT200/B - BLUE 2 ID X 4 1/2 L W/HARDWARE - $58.00/KIT - 4 LB/KIT Makes 9 large tactical devices. 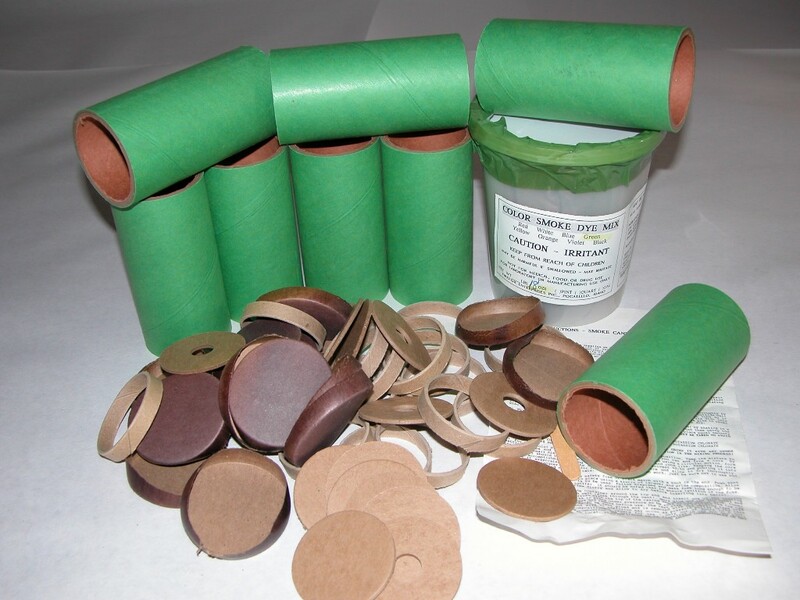 KT200/G - GREEN 2 ID X 4 1/2 L W/HARDWARE - $58.00/KIT - 4 LB/KIT Makes 9 large tactical devices. KT200/Y - YELLOW 2 ID X 4 1/2 L W/HARDWARE - $58.00/KIT - 4 LB/KIT Makes 9 large tactical devices. 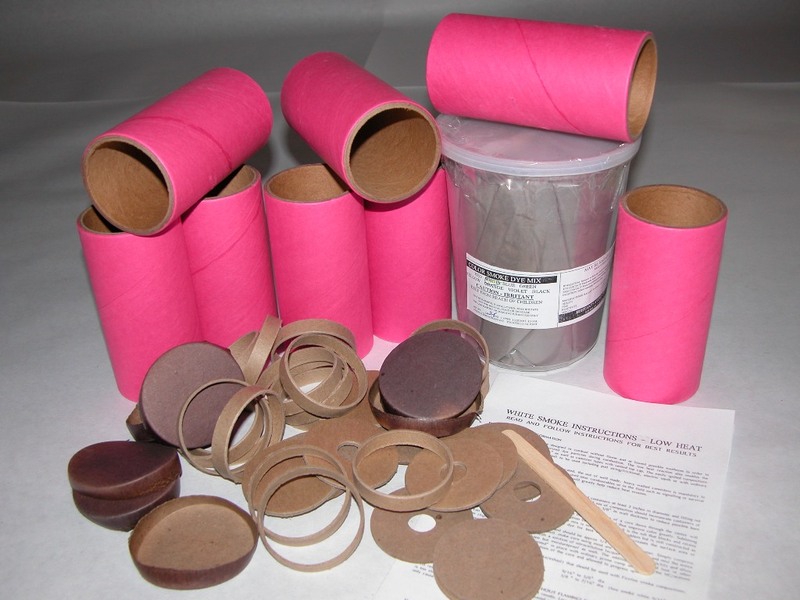 KT200/V - VIOLET 2 ID X 4 1/2 L W/HARDWARE - $58.00/KIT - 4 LB/KIT Makes 9 large tactical devices. KT200/O - ORANGE 2 ID X 4 1/2 L W/HARDWARE - $58.00/KIT - 4 LB/KIT Makes 9 large tactical devices. 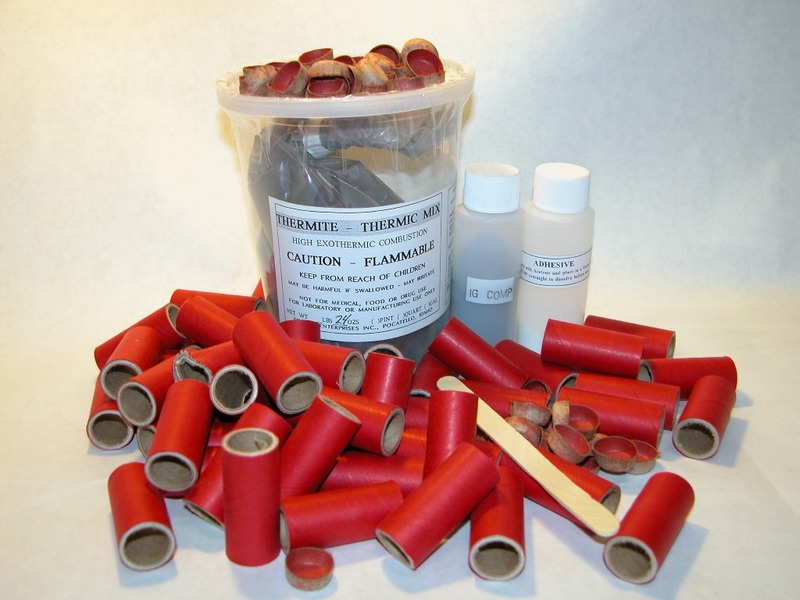 Make matchless thermite igniters! Now start emergency campfires or metal cutting without electricity or matches! Can also be used to cut off rusty locks the easy way! Sure fire ignition in any weather without matches and slowly combusts to produce heat and molten alloy metal in excess of 3000°F. Placed on wood and tinder, it will start even moist wood on fire. Keep them in glove or tool box and in the personal survival kit. Great for hunting and hiking! Kit comes with enough thermite, friction cup ignition mix, tubes and plugs to construct 25 large devices. Comes with instructions. Uses discarded strikers on books of matches to ignite. Kit no longer comes with pre-cut tubes. They are now longer to cut to spefications. No ATFE required to order this kit with tubes. KT250 - $32.00/KIT - 3LB/KIT - FS Non hazmat shipping by UPS or USPS NOW BACK IN STOCK! This unique kit has everything needed (less safety fuse) including tool set to construct and enjoy 30 ear piercing whistles. Simple and foolproof! Kit contains; enough longer tubes (you cut to length) for 30 casings (3/8" ID), 30 bottom plugs, reusable tool set, chemicals and complete instructions. Amaze everyone - use them in combination with other effects for dazzling results or attach a guide stick (long enough to balance at open end of tube) and launch them like high power bottle rockets! For best results, use and arbor press, hydraulic press or similar to compress the mixture with a case reinforcing sleeve in place to support the tube - stock #CRS2Z (not supplied). Kit no longer comes with pre-cut tubes. They are now longer to cut to spefications. No ATFE required to order this kit with tubes. HOMEMADE ELECTRIC MATCHES FOR JUST PENNIES EACH!! Compare ours to kits available elsewhere! Similar in construction to the famous Davey Fire match but designed to produce results unequaled anywhere, our Cyclone™ RC Electric match ignites flawlessly on as little as 1.5 volts - .5 amperes (single alkaline AA battery) and combusts for 1-2 seconds at over 2000° F emitting lots of sparks and molten slag to ignite stubborn compositions or devices. Very impressive! The kit comes with everything needed (less solder and soldering iron) to produce 50 igniters with 12” leads. Very easy, simply solder element “chip” to lead, mix pre-measured pyrogen and dip igniter followed by a final dip in lacquer sealant - all included. Excellent for remote control use! Average resistance is 1.3 ohms. Non explosive ignition! Non-hazmat shipping. No ATFE required to order! All you need is solder, Ruby Fluid soldering flux and soldering iron. Colorfully packaged for retail sales. $40.25/kit (1lb/ kit) Compare ours to kits available elsewhere! Firefox Hydra-Arc® Secondary Pyrogen was designed to be used as a secondary pyrogen coated over the primer itself. It does not take the place of the primer! It must be coated over it. Upon combustion, it produces a loud crackle, a shower of hot molten branching sparks and white hot temperatures capable of igniting compositions and devices that have higher than usual ignition points. Normal commercial igniters are not capable of such high temperatures and ignition properties. Each bottle comes with complete instructions and enough primer andHydra-Arc® to make up to 400 igniters (allowing for 10-15% as waste). These are as fun to watch burn as they are to be put to work!! Very impressive! Non-hazmat shipping. No ATFE required to order! Colorfully packaged for retail sales. $68.00/kit (1lb/ kit) Nothing like this anywhere at any price! Now you can make electric igniters that require NO SOLDERING OF BRIDGEWIRES TO LEADS yet will ignite reliably using as little as a 9 volt "transistor" battery up to and including 12 volt automotive and every DC voltage in between! Simply strip 3/16" of insulation from lead wires and dip into the primer slurry - allow to dry and use as is or dip them again in your favorite match composition/pyrogen. Make 50 to 100 igniters per hour for as little as 5 cents each - with no soldering! Our procedure allows you to use your lead wires over and over saving you money and time. Each bottle comes with complete instructions and enough primer and binder to make up to 500 igniters (allowing for 10-15% as waste). Liquid Element™ acts as both primer/booster and pyrogen! Basically foolproof! 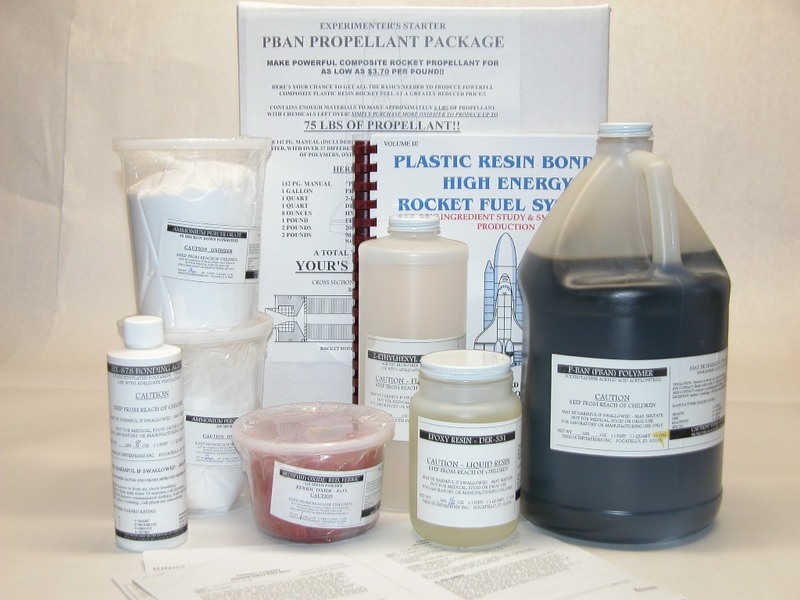 This is our most popular selling pyrogen kit for over 18 years!! $25.00/ kit (1lb/ kit) Nothing like this anywhere at any price! The competition sells a similar igniter kit (as below) for over $62.00!! Make your own electric igniters for a few pennies each using our pyrogen and any number of DC powered heating elements. Simply solder nichrome or Copel wire or Firefox igniter "chips" to 22 or 24 gauge twin lead wire, dip in the pyrogen and use. The pyrogen comes in 1/2 oz bottles that you mix a small amount of Acetone to make a thick batter for dipping - enough for approx 400 igniters. Comes with instructions. Why pay over $1.00 each for commercial igniters?! We recommend our Firefox Custom Chips (Stock# F515F instead of the Davey Clones 51 awg) or homemade elements using resistance wire diameters between 35 and 45 awg for best ignition. Non-hazmat shipping - No ATFE required. $23.50/bottle (3oz/bottle) Compare ours to kits available elsewhere! Our Pyromag magnum™ pyrogen has a higher combustion temp and burns longer (typically 2 to 3 seconds) than other pyrogens and because of the molten product and superheated sparks, it is capable of igniting the most difficult of applications. It should be used as an overcoat with a primer such as ELV or Liquid Element for reliable ignition. This professional secondary pyrogen is used extensively by special effects and rocket enthusiasts for positive ignition! Enough composition to coat approx 400 igniters! Non-hazmat shipping- No ATFE required to order. The Matallic H3 has a low enough ignition point to be used by itself on the element wire with no primer, however, it can be used as a secondary coat as well. It has a brilliant display of sparks when it fires for positive ignition of the application. 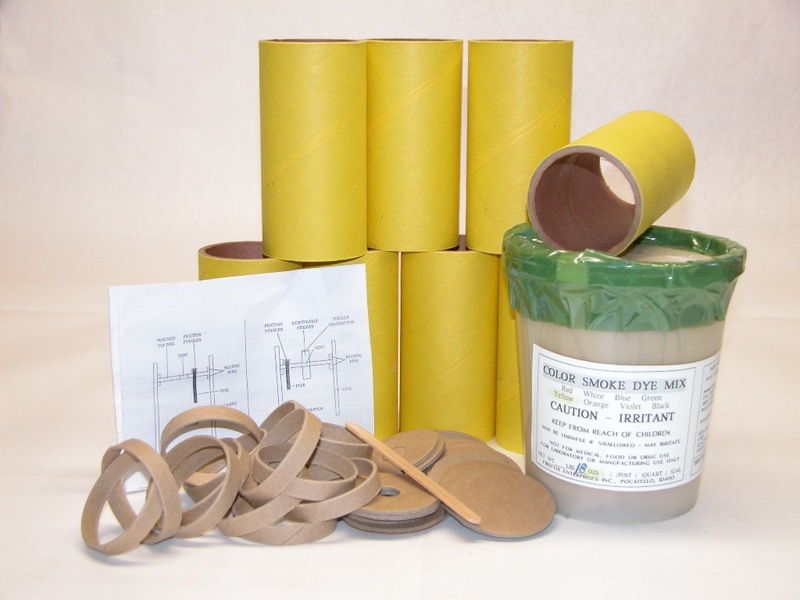 As with all our pyregen kits, they come complete with adhesive, oxidizer and instructions. Enough to make over 400 igniters! Why pay over $1.00 each for commercial igniters? Non-hazmat shipping - No ATFE required to order. Designed to be used as the primer/ booster to initate the main pyrogen (secondary, which is coated over it), the ELV primers ignite easily at lower temperatures and combust (rather than pop) at a pre-determined rate at very high temperature to reliably ignite other pyrogens and metal mixtures used as an overcoat (optional). Using zirconium and other exotic metals, we have designed two different types - conductive and non-conductive. The conductive type requires no bridge-wire so there is no soldering and ignites with as little as a 9 volt transistor battery. Simply strip 3/8" of insulation from leads, dip the tip 1/8" into the primer, dry and dip it again in a pyrogen of your own making or use our Original Blend™, Pyromag Magnum™ or Metallic H3™ for results that will have other match-makers drooling at their sight! The non-conductive type is applied to the element wire (bridge-wire) only followed by an overcoat of another high energy pyrogen. It will ignite using as little as a AA (1.5 volt) battery. Using these primers, positive, inexpensive electric ignition is easily obtained! Each type comes with enough primer to make several hundred igniters (up to 500). Do you need smaller igniters for small black powder type motors? Use the conductive ELV primer alone on 26 gauge twin lead wire with the final coat of NC or CA lacquer! Works great alone! Non-hazmat shipping- No ATFE required to order. $25.00/bottle (3oz/bottle) Compare ours to kits available elsewhere! Designed to be used as the primer/ booster to initate the main pyrogen (which is coated over it), the ELV primers ignite easily at lower temperatures and combust (rather than pop) at a pre-determined rate at very high temperature to reliably ignite other pyrogens and metal mixtures used as an overcoat (optional). Using zirconium and other exotic metals, we have designed two different types - conductive and non-conductive. The conductive type requires no bridge-wire so there is no soldering and ignites with as little as a 9 volt transistor battery. Simply strip 3/8" of insulation from leads, dip the tip 1/8" into the primer, dry and dip it again in a pyrogen of your own making or use our Original blend™ Pyromag Magnum™ or Metallic H3™ for results that will have other match-makers drooling at their sight! The non-conductive type is applied to the element wire (bridge-wire) only followed by an overcoat of another high energy pyrogen. It will ignite using as little as a AA (1.5 volt) battery. Using these primers, positive, inexpensive electric ignition is easily obtained! Each type comes with enough primer to make several hundred igniters (up to 500). Do you need smaller igniters for small black powder type motors? Use the conductive ELV primer alone on 26 gauge twin lead wire with the final coat of NC or CA lacquer! Works great alone! Non-hazmat shipping- No ATFE required to order. 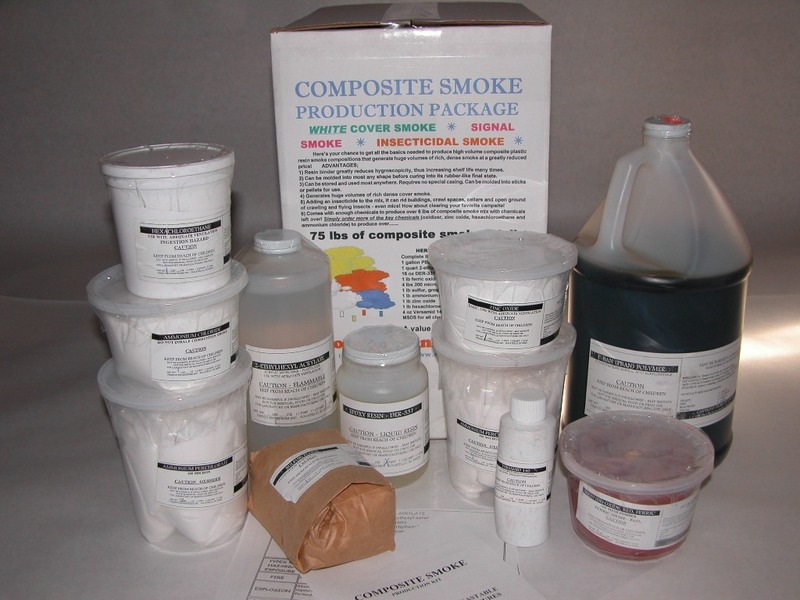 Here's your chance to get all the basics needed to produce high volume composite plastic resin smoke compositions that generate huge volumes of rich, dense smoke at a greatly reduced price! 75 lbs of composite smoke mix! Comes with complete, illustrated instructions and enough chemicals, binders and curatives to get you started. EACH KIT INCLUDES ENOUGH MATERIALS TO MAKE APPROX. 6 LBS OF PROPELLANT WITH CHEMICALS LEFT OVER! 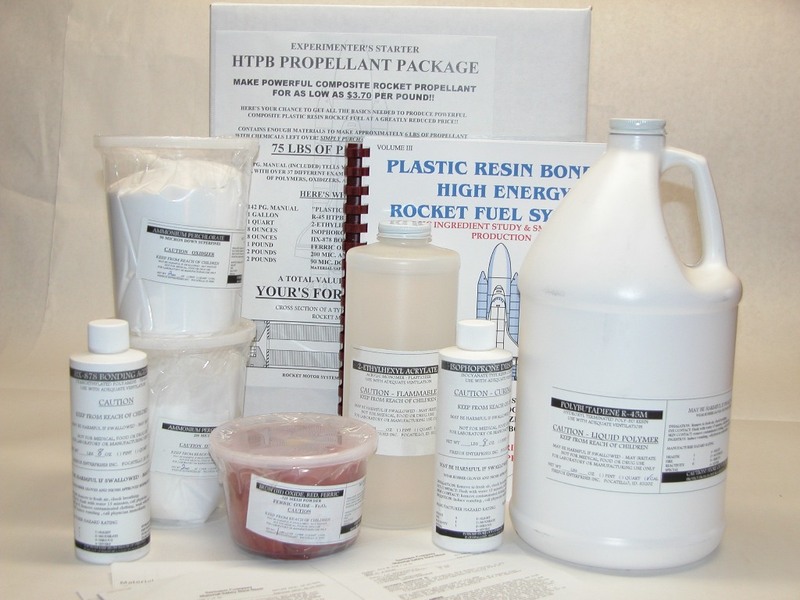 SIMPLY PURCHASE MORE OXIDIZER TO PRODUCE UP TO 75 LBS OF PROPELLANT! ALL THIS, A TOTAL VALUE OF OVER $194.15! ALL THIS, A TOTAL VALUE OF OVER $181.35!